SSC CHSL 2019 -The Staff Selection Commission (SSC) has provided the link to check the application status of SSC CHSL 2019 at ssc.nic.in on March 09, 2019. The application window also is opened until April 05, 2019.The candidates who have completed their 12th and are in the age group of 18 to 27 years can apply. The vacancies are not notified yet, will be notified in due course. The SSC CHSL 2018 Tier I examination will be held from July 01 to 27, 2019. The Tier II examination will be conducted on September 29, 2019. Get, here all the details regarding SSC CHSL 2019. Latest: The application form filling last date is April 05, 2019 . Click here to register for SSC CHSL 2019. The candidates belonging to the category SC/ST/ OBC/ /Ex-servicemen (ESM) / PWD Economically Weaker Sections (EWS) will be provided the appropriate relaxation as per the Govt. Rules. But the candidates have to upload the valid certificated issued by the competent authority. The Staff Selection Commission has released the application form of SSC CHSL 2018 at ssc.nic.in. The candidates who are eligible as well as interested can fill the application form. The link for applying is provided above. At first, the candidates have to register themselves. For submitting the application form the candidates have to pay the application fee. The application fee has been decided as per the category of the candidates. The application fee for SSC CHSL 2018 is Rs. 100/-. But the candidates belonging to the SC/ST/PWD category and women candidates are exempted to pay the application fee. There are two modes of payment, the Online and offline. The candidates who want to make online payment can use the BHIM UPI, Net Banking, by using Visa, Mastercard, Maestro, RuPay Credit or Debit cards. For making the cash payment the candidates can generate the SBI Challan. Note: The application fee is non – refundable. As of now, the vacancies have not been introduced by the SSC. The vacancies will be notified in due course. However, the recruitment of the candidates will be done for the following post. 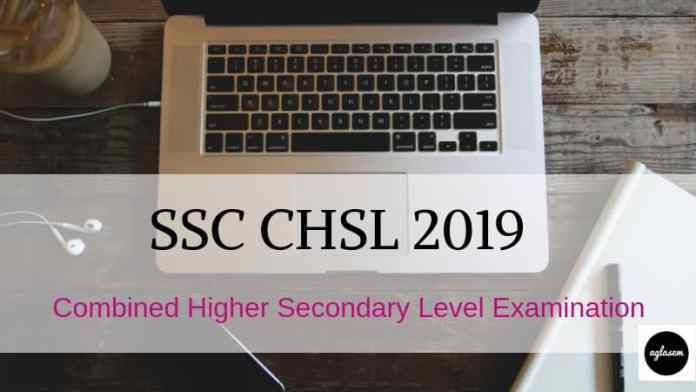 You are eligible to appear in SSC CHSL Exam 2019 only if you fulfill eligibility criteria. Expected eligibility criteria are as follows. Or a person of Indian origin who has migrated from Pakistan, Burma, Sri Lanka, East African countries of Kenya, Uganda, the United Republic of Tanzania(Formerly Tanganyika and Zanzibar), Zambia, Malawi, Zaire, Ethiopia and Vietnam with the intention of permanently settling in India. Any candidate who is in the age group of 18 to 27 years as on 01 January 2019 are eligible to apply. SSC is also providing the age relaxation to the candidates. The candidates can check age relaxation here. Candidate must have passed class 12th or equivalent examination from a recognized board or university. SSC will issue the admit card for the CHSL at ssc.nic.in. Once the application process overs the candidates who will successfully fill the application form will be issued the admit card for Tier I admit card. The admit cards are usually updated on the website before 07 days of examination. The candidates are required to provide the registration number and password to download the admit card. SSC provides the admit card on the regional websites. The candidates ahve to download the admit card as per their regions. For each tier, the separate admit card is issued. The candidates ahve to download the admit card from the official website. Apart from that, no other mode will be available. . The selection of the candidates is based on the performance of the candidates in Tier I, II, III. The candidates have to qualify each stage separately. The examination pattern of SSC CHSL 2019 has been explained below. Marking Scheme: 02 marks will be awarded for each correct answer, 1/2 mark will be deducted for incorrect answer. Note: The questions for Part I, III & IV will be provided in Hindi and English Language. The qualifiers of the Tier I examination will be called for the Tier Ii examination. the candidates ahve to qualify the examination for further selection. Note: The candidates are to attempt the paper in Hindi or English Language. Tier III also called as the skill test. In this test, the candidates have to undergo the typing test. Note: Tier III will only be qualifying in nature. Knowing the syllabus of SSC CHSL 2019 is a key part of doing well in the exam. SSC 10+2 2018 Exam Syllabus contains topics on which questions are asked in the exam. The candidates can download the SSC CHSL Syllabus 2019 from here. SSC will conduct the examination in all over the country. The Commission has divided the entire country into 09 regions. Take a look at the examination city and their respective codes. Central Region (CR) Bhagalpur (3201), Darbhanga (3202), Muzaffarpur (3205), Patna (3206), Purnea (3209), Agra (3001), Aligarh (3002), Allahabad (3003), Bareilly (3005), Gorakhpur (3007), Jhansi (3008), Kanpur (3009), Lucknow (3010), Meerut (3011), Moradabad (3015), Varanasi (3013). Eastern Region (ER) Port Blair (4802), Bokaro (4201), Dhanbad (4206), Jamshedpur (4207), Ranchi (4205), Balasore (4601), Behrampur-Ganjam (4602), Bhubaneshwar (4604), Cuttack (4605), Rourkela (4610), Sambalpur (4609), Gangtok (4001), Asansol (4417), Hooghly (4418), Kolkata (4410), Siliguri (4415). Southern Region (SR) Chirala (8011), Guntur (8001), Kakinada (8009), Kurnool (8003), Nellore (8010), Rajahmundry (8004), Tirupati (8006), Vijaywada (8008), Vishakhapatnam (8007), Vizianagaram (8012), Puducherry (8401), Chennai (8201), Coimbatore (8202), Madurai (8204), Salem (8205), Tiruchirapalli (8206), Tirunelveli (8207), Vellore (8208), Hyderabad (8601), Karimnagar (8604), Warangal (8603). After successful conduction of the examination, SSC will release the answer key of the CHSL examination at ssc.nic.in. The answer key is usually published within 01 months of examination. The exam of SSC CHSL held in three parts, i.e. Tier-I & Tier-II, III. Tier-I will be objective type and Tier-II will be the descriptive type and Tier III will be a skill test. So the answer key of SSC CHSL Tier-I Examination will be released. As Tier-II is descriptive so there is no need for the Answer key. The candidates who will appear in the examination can check the answer key. Along with displaying the answer key, the Staff Selection Commission (SSC) will invite objections to the tentative answer key. After considering the objections the final answer key will be released. SSC announces CHSL result in this order First, SSC CHSL 2018 Result of Tier I indicating candidates shortlisted for appearing in Descriptive Test (Tier II) will come. Then marks of candidates of Tier 1 region-wise will publish. After that Result of Tier II will release as 3 lists. List 1, 2, 3 will be for candidates qualified for DEST for DEO in CAG, candidates qualified for typing test for PA/SA / LDC / Court Clerk, candidates qualified for DEST for DEO in departments other than CAG respectively. Next, the SSC will announce the marks of candidates of Tier 2 in roll number order. Ultimately final result of SSC CHSL 2018 will be announced. The selection procedure of SSC CHSL includes three phases of examination. In each phase examination, the candidates have to qualify. SSC has decided the minimum qualifying marks for CHSL 2019. The candidates have to obtain a minimum 33% marks in Tier I + Tier II examination, only then they will be eligible to appear in Tier III examination. The candidates should note that Tier III examination will be qualifying in nature. No marks will be awarded in the Skill Test. The position of the candidates in the merit list is entirely depended on the marks obtained in Tier I and Tier II. After selection, the candidates will be paid as per the pay scale decided by the Government of India. The post wise pay scale has been provided below. Postal Assistant (PA)/ Sorting Assistant (SA) will be paid according to the Pay Band -1and initial pay will be of Rs. 5200-20200 + Grade Pay: Rs. 2400 (pre-revised). Data Entry Operator (DEO) monthly pay will be Rs. 5200-20200) and Grade Pay of Rs. 2400 (pre-revised). For more details about SSC CHSL 2019 download the advertisement.